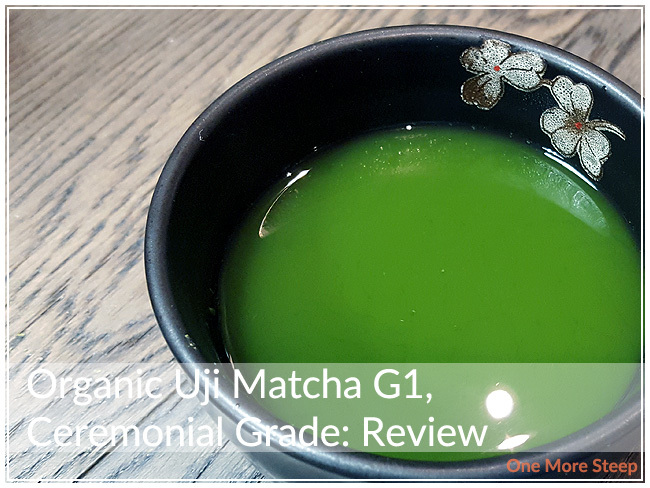 Yunomi has provided me with Organic Uji Matcha G1, Ceremonial Grade for the purposes of providing an honest review. 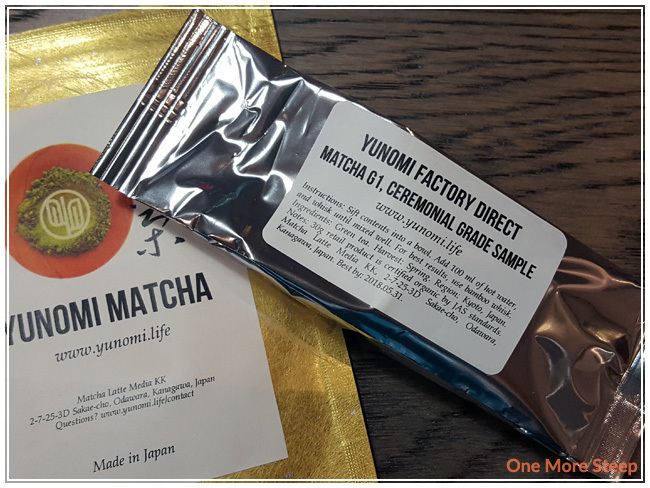 Organic Uji Matcha G1, Ceremonial Grade, came to me from Yunomi in a beautiful gold foil resealable bag – the match was inside in a separate foil packet for me to rip open (and I tried so hard not to spill any of the matcha out – I did fail a little bit). This organic matcha comes from Wazuka, Kyoto and was harvested in spring 2016. My personal experience with preparing matcha is quite limited, but I did my best! This matcha consists only of green tea. The powder is a bright spring green, I noticed a few clumps in the dry powder – probably from being compressed in the packaging. I would describe the smell of this tea as being grassy – it reminded me a lot of the smell of a freshly cut lawn. 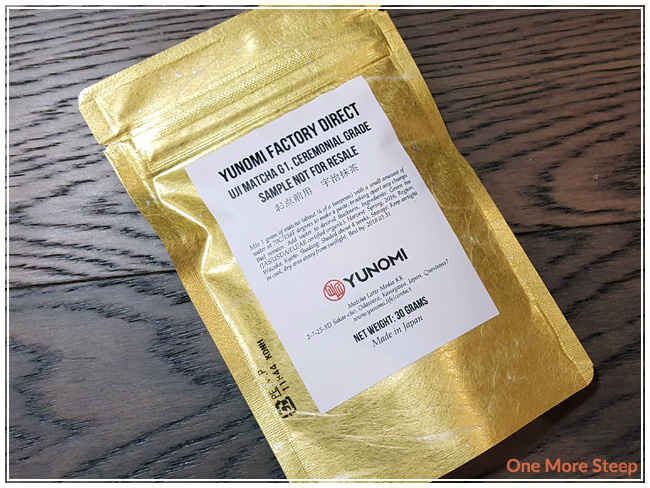 Yunomi recommends mixing 1g (¼ teaspoon) with a small amount of water (70°C/158°F) to make a paste, and then to add water to the desired thickness. What I did was use a bamboo scoop to put a small amount of the matcha into my bowl, and then whisked it with a small amount of water. Once it was clump-free, I added some more water until I had about ¾ of a bowl of match to drink. I’m quite the novice when it comes to matcha, but I did try my best with this one. For the whisking motion, I do a repeated M shape back and forth in the bowl until it seemed clump-free and well mixed in, although I never did manage to get a very good froth going so I suspect that I might not have used enough for the matcha. Live and learn! Uji Matcha G1 mixes to a beautiful green. The aroma is subtle from the whisked green tea though, I found it not as strong as expected, but my matcha experience prior to this has been primarily matcha lattes prepared for me which were probably full of more than just matcha, water, and dairy products. I found to the flavour to be surprisingly sweet, it reminded me of honeydew melon, with some grassy/vegetal notes. There’s a nice smoothness to this tea, and I must have mixed it enough because there was no graininess or clumps noted as I drank it. There was a touch of bitterness that I noted at the tail end of each sip, but it’s not enough to be off-putting. As matcha is a powder that you mix into the water to drink, there were no second steeps here! 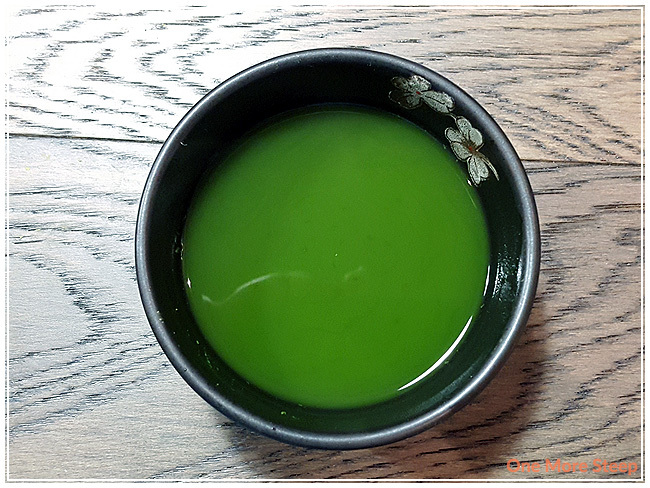 I loved Yunomi’s Organic Uji Matcha G1, Ceremonial Grade. I found this matcha to be really enjoyable. The mix of sweet and grassy flavours made this complex and quite fun to drink. 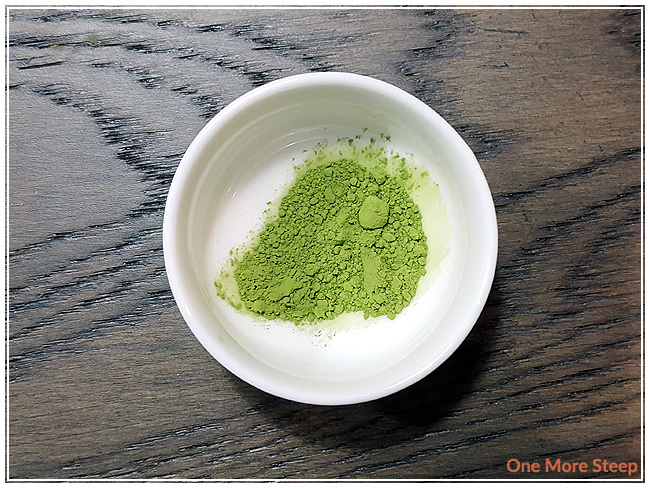 The process of mixing this matcha was fun for me, and I found it to be a great way to slow down and enjoy the tea making process. I realize that Uji Matcha G1 is on the more expensive side, however it is quite tasty. I would consider this to be more of ‘treat’ or special occasion matcha due to the associated costs. However, if you consider it by servings, you get 30 servings in a 30g bag, and that works out to be $1.67/cup – probably a lot cheaper than a matcha at your local café.